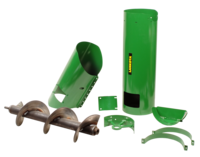 The LANAUG1135GS is an uloading auger grain saver door kit for John Deere® 60, 70, and "S" Series combines with 13.5" standard auger (non-HUR). This kit replaces the factory unloading auger "Dribble" door. The LANAUGHURGS fit John Deere® 60, 70, and "S" Series factory 13.5" standard auger (non-HUR), and the Lankota 13.5" non-HUR auger extension kit, LANAUG1135K.